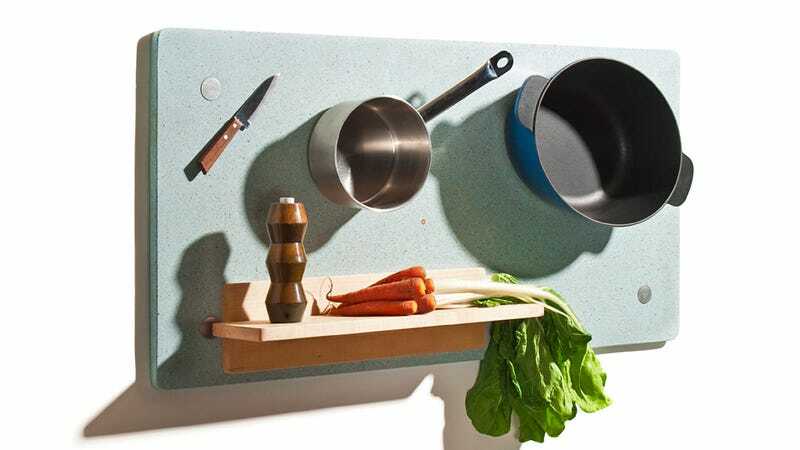 There's no such thing as having too much storage space, and with designer Felix Muhrhofer's Magic Wall panels you can store pots, pans, and cutlery on literally every last inch of your kitchen. It's all made possible through the use of a heavy-duty magnetic backing that allows certain items in your cooking arsenal to just cling to the panels. So that they blend in with your kitchen's capacity and decor, the Magic Wall panels come in a wide variety of sizes and finishes including terrazzo stone and even wood to match a butcher block counter top. And they range in price from around $350 to almost $1,400. There's also a small assortment of magnetic accessories available including shelves and plant pots, but the prospect of freeing up counter space by being able to just slap a toaster on the wall is seemingly its biggest selling point.